Plug this into a laptop and you're good to DJ anywhere. Good news for users of Numark´s MixMeister software - a dedicated hardware controller for the application is on the way. Known, appropriately enough, as MixMeister Control, this is also compatible with other MIDI-capable DJing software. Looking more like a traditional sequencer than a mixing app, MixMeister automatically beatmatches any tracks that you import into it. A copy of the Fusion version of the software ships with the Control hardware, which connects to your computer over USB. 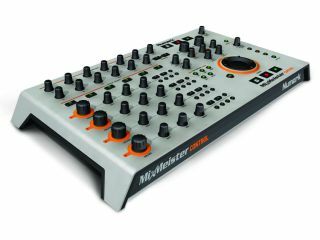 MixMeister Control offers 40 knobs, 53 buttons and a jog wheel, and enables you to mix up to four tracks at once. It gives you instant access to the software´s looping, EQ and FX features. There´s no word on a price at this stage, but it has been announced that MixMeister Control is Mac- and PC-compatible and will ship in the second quarter of 2008. Find out more at the Numark website. Numark has also launched Cue Magazine, a digital publication that features gear info, artist interviews and videos. A low bandwidth version can be viewed online, and there are also downloadable editions for Mac and PC.